A senior police officer should receive a final written warning after admitting gross misconduct, according to a disciplinary panel. 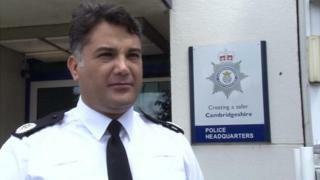 Naveed Malik, Assistant Chief Constable of Cambridgeshire Police, accepted he tried to give interview topics to an inspector going for promotion. Panel chair Dorian Lovell-Pank said ACC Malik had asked for his record "to be weighed in the balance of his favour". A final decision will be made by the force's Deputy Chief Constable. The panel's recommendations will go to DCC Alan Baldwin, who is expected to make his decision later this week. The misconduct hearing at Wyboston Lakes Conference Centre, Bedfordshire, heard ACC Malik was to chair the second stage of interviews for the promotion. He and his panel agreed to change the wording of one the questions on day one of the three-day process. ACC Malik also instructed a police staff member, known as B, to call the inspector, known as A, and tell them the four areas to focus on. The inspector then said "go back and tell [ACC Malik] that I didn't want to listen", before reporting the matter to the Chief Constable. The promotion process, which was due to take place in February, was terminated the following day. Chris Daw QC, for ACC Malik, said it was a "momentary lapse of concentration, a single error of judgment, in the context of an unblemished and outstanding career". ACC Malik said he was "deeply embarrassed" by his actions.